I am broadly interested in the use of genetic techniques in conservation, and the preservation of genetic diversity. Conservation of genetic diversity is just as important as the conservation of species diversity, if not more so, as it preserves the evolutionary potential of a population and therefore gives greater opportunity for adaptation to future change, which is likely to be unpredictable. I wish to pursue a research career in the field of conservation and the genetic management of populations. I hope that I might contribute to the understanding of what makes management strategies effective from a genetic perspective. I am currently undertaking a PhD in molecular ecology and conservation of Mobulid rays at Bangor University. During my undergraduate studies at the University of Sheffield, I conducted a meta-analysis exploring the implications of habitat fragmentation for the genetic diversity of animal populations. After graduating, I joined marine ecologists at the University of Sheffield as a Research Technician. In collaboration with Flanders Marine Institute, I worked on the integration of several large datasets of the biological traits of marine benthic invertebrates into the World Register of Marine Species (WoRMS). On completion of this project, I began studying for an MRes in Biodiversity and Conservation at the University of Leeds. Keen to build on my practical laboratory skills, I used genetic methods to identify nematode parasites of Galapagos tortoises and place these within the wider nematode phylogeny. MRes Biodiversity and Conservation, University of Leeds (2013-2014). BSc Zoology, University of Sheffield (2010-2013). 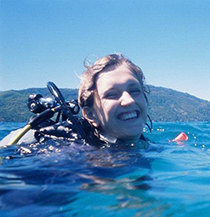 Genetics Project Manager to the Manta Trust (September 2014-present). Research Technician, Department of Animal and Plant Sciences, University of Sheffield (Summer 2013) - Integrating biological traits of European marine benthic taxa into the World Register of Marine Species. Seasonal Animal Keeper, Woburn Safari Park (Summers 2011 and 2012). Research Assistant with Frontier Madagascar (Sept 2012). 2015: Save Our Seas Foundation Keystone Grant – Mobulid genetics project – US$20,000. Based in the Molecular Ecology and Fisheries Genetics Lab (MEFGL), and supervised by Professor Gary Carvalho, Dr Mark de Bruyn and Dr Rob Ogden at the Royal Zoological Society of Scotland and TRACE Wildlife Forensics Network, my PhD focusses on developing novel genetic tools for the conservation of vulnerable Mobulid (Manta and Mobula sp.) rays. This project has been made possible by funding from NERC through the ENVISION DTP, the Royal Zoological Society of Scotland and a Keystone Grant from the Save Our Seas Foundation. Manta and devil (Mobula) rays are elusive, little-studied organisms, and provide a charismatic and significant component of marine megafauna. Tourism for manta ray-watching generates $73 million per year and therefore generates significant revenue for countries such as Mozambique and the Maldives. Mobulid rays are under threat from both targeted and bycatch fisheries supplying the recent increase in demand for their gill rakers for use as a pseudo-remedy in some Traditional Chinese Medicines. Such exploitation will likely be met by disastrous declines exacerbated by their long time to sexual maturity, infrequent reproduction and low fecundity. As a result of such trade, the genus Manta has been listed on the Convention on International Trade in Endangered Species (CITES) which regulates the trade in threatened species internationally. Yet morphological similarities and taxonomic uncertainties make identification of mobulid rays and their traded parts challenging. Furthermore, if effective management strategies are to be implemented, understanding of their population and genetic structure is required. The current project sets out to advance understanding of population structure, demographic history, speciation and adaptation in Manta rays in order to effectively inform conservation policy, and to provide a genetic means of identification of all Mobulids to aid in the enforcement and future implementation of CITES in their protection. Describe population structure and demographic history of both species of Manta throughout their range through a ‘seascape genetics’ approach. Examine processes leading to differentiation at the genomic and trait level between the recently diverged Manta species. Apply data from patterns of genomic divergence among populations to generate recommendations for prioritising populations for conservation. Enable species identification and traceability of mobulid products to address monitoring and enforcement. The project uses advances in next-generation sequencing techniques to describe population structure and demographic history of Manta rays throughout their entire range, and investigate the extent of local adaptation in populations in order to generate recommendations for prioritising populations for conservation. Furthermore, it will investigate the processes leading to differentiation between the recently diverged Manta species. Finally, in order to address the exploitation of rays for their gill rakers, the current project works towards developing a Global mobulid Genetic ID kit which can be used by scientists and enforcement authorities alike to identify a specimen to species and regional level. These objectives will be achieved using double digest Restriction Site Associated DNA sequencing (ddRAD) techniques to identify Single Nucleotide Polymorphisms (SNPs) of interest.